Shoki reminding me that if he can reach it, he’s gonna eat it! considerations you will face. What you feed your horse is also one of the most critical decisions you can make. And if you have more than one horse and/or your horse(s) are maintained on limited acreage and/or your feeding regimen is dictated by the barn owner where you board your horse(s), the dilemma can become even more complicated. Add the fact that the $300 billion equine industry in America makes access to unbiased information and research very difficult… and that equine veterinarians and farriers typically have very little training in equine nutrition… it’s enough to make many of us want to throw our hands up in disgust. But, I have some good news. Over the past 16 years I have learned a lot (most of it the hard way) about equine nutrition. And in this blog post I’m going to share some of the most important things I’ve learned (as well as links to some of the best free information I’ve found) so that you can more easily make truly informed decisions, spend your money wisely, keep your horses healthy and keep yourself sane! 1. The digestive system of the horse is designed to (effectively) handle only one type of feeding protocol: slow and mostly continuous intake of medium quality forage spread fairly evenly over a 24 hour period, with occasional rests of 1-3 hours. 2. The digestive system of the horse is NOT designed to handle intake of large ￼￼quantities of any feed stuff (forage or grain) at one time. It is also NOT capable of effectively digesting feeds that are high in sugars and starches. Over time, if these types of feeds are given – and especially if given in large quantities to horses that are not in heavy daily work – it’s only a matter of time before the digestive system becomes over-taxed, resulting in a cascade of metabolic health issues. 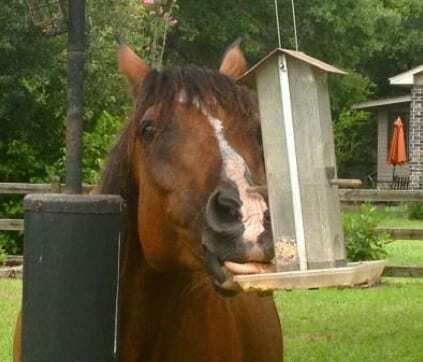 For a quick and easy read on why traditional horse feeds can actually make our horses sick, read this article. 3. If you only understand one thing about commercial horse feeds, it should be what non-structural carbohydrate (NSC) levels are. 4. Feral (wild) horses eat a diet that consists of a variety of native grasses that, overall, have a significantly lower NSC than our cultivated pasture grasses or cultivated grass hays do. For a better understanding of feral horse diets, read this article. 5. Our domestic horses are at a disadvantage from the get-go because the forage sources they/we have access to are typically less diverse and much ￼higher in NSC than the forages that feral horses would have access to. So, in order to avoid the development of common metabolic issues like laminitis, founder, EMS, insulin resistance and Cushing’s Disease in our domestic horses, we have to be careful to make sure that anything we feed in addition to their forage intake has low NSC (no greater than 12%, if possible). For a ton of excellent information on grass pastures and laminitis, visit www.safergrass.org/articles. 6. If you have a horse that already has metabolic issues, you may need to find both hay and feed sources that have even LESS than 12% NSC. If you are in that situation and are unsure what to do, go here for some ideas. You might also want to consider having your hay sources tested for NSC levels. This article provides a lot of useful information about getting your hay tested. 7. Grains of any kind (whether sweet feed or pelleted feed or raw grains like corn, oats or barley) are risky. Most research on equine nutrition is funded by the major feed companies so it’s not easy to find unbiased information about commercial grains. This article explains why many “traditional” horse feed ingredients like corn, oats and barley are actually not good for ￼most horses. Also, any feed with even trace amounts of molasses can be extremely bad for horses with metabolic issues. Now that we’ve gone over the basics, let’s talk about the COST of feeding horses. Most horse owners obsess about what their hay and feed costs are per bale/bag. But, the reality is this: if your feeding regimen or the products you feed (or both) are working in opposition to the way the horse’s natural digestive system works… you are going to end up with health issues. And health issues lead to vet bills. They also lead to farrier bills and an endless hunt for the “right supplements” and/or medications to offset the plethora of side effects that come from a poor nutrition program (cracked hooves, thrush, allergies, poor coat condition, poor muscle tone, “hot” behavior, ulcers, etc.). 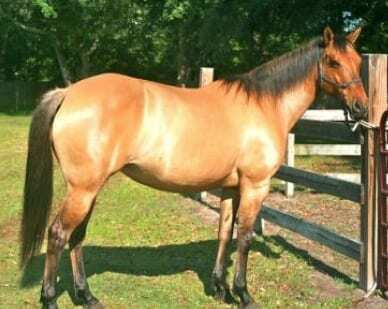 This is the kind of shine and body condition my horses have gotten since switching to CoolStance. Free-choice (always available, 24 hrs per day) medium-to-high quality grass hay (I feed mostly locally grown Bahia or Coastal Bermuda that I get for $6.00-$7.00 per bale). Because two of my horses are extremely “easy keepers” and they don’t get much regular exercise, I use slow-feeder hay nets that slow down their rate of consumption considerably. The nets allow me to give the horses free-choice access to the hay (which prevents ulcers and also keeps them busy and happy) without allowing them to over-eat. My favorite type of hay net (and I’ve tried many!) is the heavy duty netting version made by Hay Burners Equine. I’ve had my four Hay Burner nets for three years now and they are still going strong with daily use! Well worth the cost. Controlled access (8-12 hours of turnout per day) to grass pasture. Because one of my horses has a past history of metabolic issues, I usually try to turn mine out on the grass pastures at times when the sugar content is lowest. CoolStance (low NSC forage-based alternative to grain), fed 2x per day for healthy coat, hooves and body condition, plus energy for riding and other activities. I can’t say enough good things about this amazing feed!! It has significantly improved the health, emotional wellbeing and physical appearance of all three of my horses. For a listing of U.S. retailers that carry CoolStance, go here: www.stanceequineusa.com/where-to-buy. If there is not currently a retail seller in your area but you are interested in getting local access, I can help. All you need to do is put together a group of local horse owners who (combined) can guarantee purchase of at least 45 bags of CoolStance within the next 30 days and I will contact your local feed store to arrange delivery of a pallet of CoolStance. I’m willing to help facilitate this because I feel so strongly about the product that I want to make it accessible to as many horse owners as possible here in the U.S. Just email me if you need my help! Because CoolStance is not a “complete feed” (meaning it is not supplemented with vitamins and minerals), the one supplement I feed is Horse Tech’s High Point for Grass Hay daily vitamin/mineral powder. This is a high quality supplement that is also very low in sugars/starches. When all is said and done, this simple feeding regimen (despite involving two products that are not inexpensive), has saved me a tremendous amount of money over the years. The cost savings come from using slow-feeder hay nets, buying low-cost grass hay instead of more expensive Timothy or Alfalfa, significantly reduced vet bills, no need for an ever-changing cocktail of supplements to address the latest ailments, and no need to buy expensive grooming supplements (my horses’ coats stay rich and shiny, and their hooves are beautiful, even without regular grooming due to the benefits of the coconut oil in the CoolStance). Additional surprises I’ve experienced since transitioning from traditional grains to CoolStance include: reversal of anhydrosis in one of my mares, significant weight loss in my formerly obese Arabian gelding, and calmer and more stable behavior in all three horses (no more metabolic chaos causing behavioral issues). Disclaimer: I am not a trained or certified nutritionist, but I hope this information is helpful. I sure wish someone had handed me such a resource when I was a new horse owner! As I said in the title of the blog… you can thank me later. Kim Hallin is an accomplished horse trainer specializing in humane methods that uphold the integrity of the horse. She loves to nurture the powerful bonds that can develop between people and animals. Kim recently launched Unbridled LLC, a business that brings humans and horses together in a collaborative learning process designed to enhance leadership and communication skills while developing greater overall self-awareness. Kim just joined our small team at Stance Equine USA as the Creative Director. To learn more about Kim, please go to www.unbridled.guru.